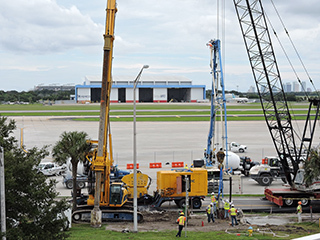 Tampa International Airport officially broke ground on its historic $953 million Master Plan expansion on Nov. 20, 2014, launching the largest construction effort at TPA since 1971. Major components of the project include an expanded Main Terminal, automated people mover and 2.6-million square foot rental car center. You can keep up with all the activity by regularly visiting this Master Plan Progress page. Mitsubishi and its subcontractors have officially begun construction on the SkyConnect! Earlier this week, they began drilling and installing rebar that will eventually become the two running surfaces for the new train. The train’s wheels will run on top of these concrete tracks. In order to place the rebar, crews are using a specialized piece of equipment known as a gang drill. The device rapidly drills four holes in the concrete, ensuring that the holes are perfectly aligned. Rebar is then fitted in the holes and eventually covered in concrete. It may not look quite like a train station yet, but construction crews are making lots of progress on the SkyConnect station at the Main Terminal. Workers are in the process of building the station’s two elevator shafts, which are currently around 66 feet high. That’s just below the platform level. The shafts will eventually rise to 97 feet. The construction of the elevator shafts will be followed by construction of new quad decks and the installation of structural steel in July. 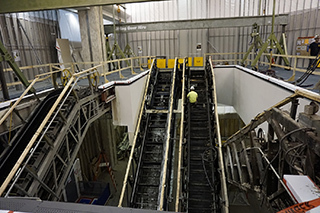 Behind construction walls in the Main Terminal, crews have been working for months to replace TPA’s old and outdated escalators with new variable speed escalators. The first bank of escalators – five in total – is now in place. The escalators will be operational later this summer. Once they’re open to the public, crews will take the second bank offline. Eventually, all four banks of escalators – a total of 1,112 linear feet – will be replaced. The new escalators are designed to slow down when not in use, reducing energy consumption and saving money. May 23, 2016: CNBC opens on Airside A! The new concessions just keep coming to Airside A. On Monday, CNBC smartshop opened its gate, becoming the first new retail store and third new concessions on the Airside. In addition to all the usual news convenience store options, CNBC will also feature grab-and-go food delivered by a Tampa Bay icon: Alessi Bakery. In order to construct the 1.4-mile SkyConnect guideway, construction crews had to first drill hundreds of underground support shafts. Six-hundred and fifty six, to be exact. As of May 19, all of the concrete and rebar support shafts – known as drilled shafts – are in the ground. It’s a major milestone for the SkyConnect project that paves the way for crews to continue working on all parts of the guideway. 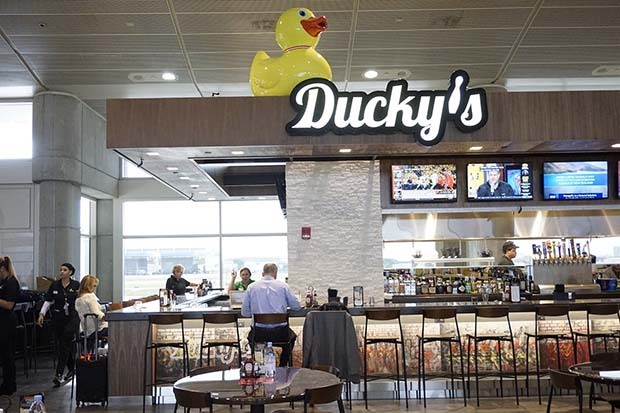 Tampa International Airport’s newest restaurant is now open on Airside A! And it has a large yellow duck perched on top. Ducky’s bar and restaurant features elevated bar fare, craft beers/cocktails and bread baked fresh from La Segunda Bakery in Tampa. It has an extensive menu with options ranging from burgers and buffalo chicken to smoked duck quesadilla and candied duck bacon. Not to be outdone by the food, the restaurant itself features art by well-known St. Petersburg graffiti artist BASK. 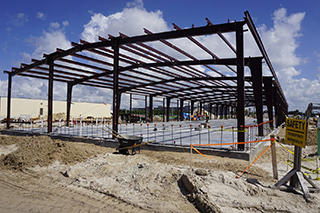 The consolidated rental car center has reached its full height in certain sections – and now structural steel is beginning to be lifted into place. 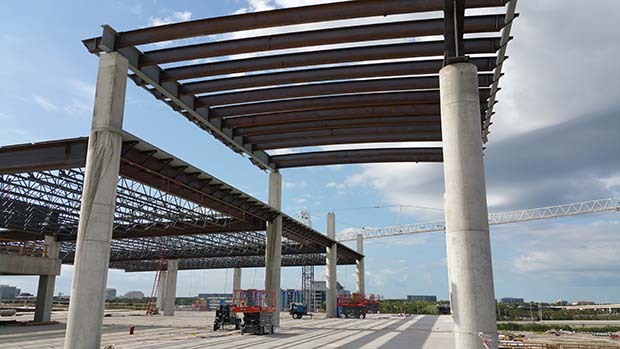 Crews started installing the steel over the section of the rental car center where passengers will enter from the new SkyConnect train. Large cranes are required to hoist the steel beams – some as heavy as 54,000 pounds – above the building’s fourth floor. 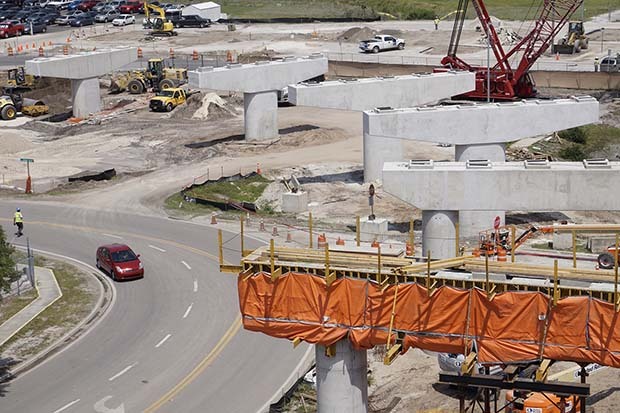 About 100 feet longer and wider than the previous bridge, the new Taxiway J bridge will be wide enough to accommodate the Airport’s new SkyConnect train underneath. The bridge will have more than three feet of concrete in some places and is designed to accommodate planes that weigh roughly 1 million pounds, including the Boeing 777 and 747. A lot of concrete and rebar go into making a bridge that strong. In total, the bridge will have about 42 million pounds of concrete and 1.5 million pounds of rebar. 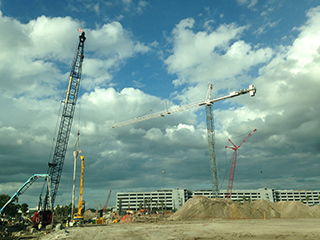 The number of workers on Tampa International Airport’s historic expansion continues to rise. 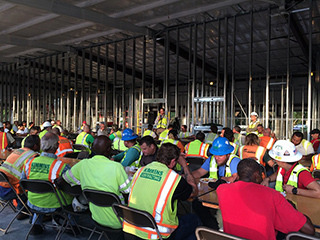 For the month of May, the Airport’s design-builders had approximately 1,450 workers on site. That’s up from about 1,200 in February. 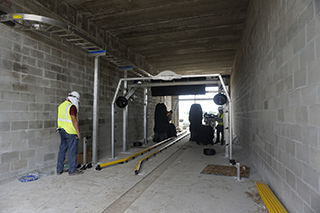 Once again, the vast majority of workers – about 1,000 – are building the Airport’s new automated people mover and rental car center under Austin Commercial. Skanska USA, which is constructing the Main Terminal expansion, has about 350 workers. 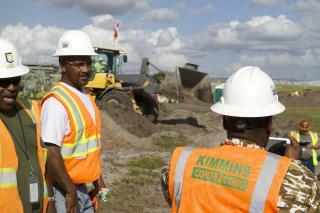 Cone & Graham has a little more than 50 workers; Kimmins has about 45 on roadway improvements. This photo depicts workers with Austin Commercial at their regularly scheduled morning safety meeting. 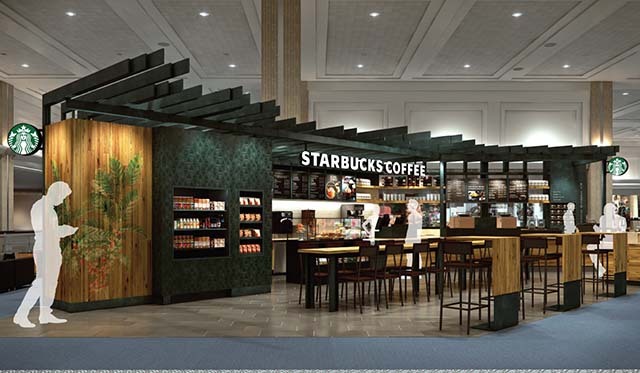 April 28, 2016: New Starbucks opens on Airside E! 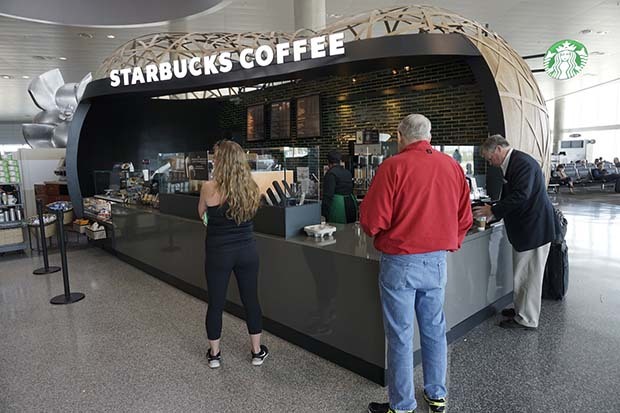 Today, Tampa International Airport opened a new Starbucks on Airside E as part of the Airport’s ongoing concessions redevelopment program. The new Starbucks will feature all your favorite coffee drinks, pastries and sandwiches. The Starbucks also has new power outlets and USB ports. The new opening is part of major concessions changes on the airside. We are closing five concessions in late April/early May on the Airside, making room for a slew of new concessions, including Panda Express, Potbelly Sandwich Shop, Victoria’s Secret, InTune Electronics and Air Essentials. The SkyConnect guideway continues to take shape! This picture, taken April 26, shows crews installing a number of I-beams along a curved portion of the guideway near the Economy Garage. 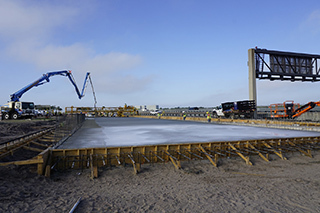 Once the I-beams are installed and a running surface is put in place, Mitsubishi will come in and begin to build the track for the SkyConnect. 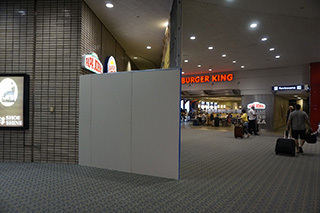 New construction walls are up inside the Main Terminal as part of Tampa International Airport’s ongoing expansion and concessions redevelopment program. Late Tuesday, crews began to wall off the space that formerly housed four stores – Bijoux Terner, Swarovski, Tallie and Sunglasses International. 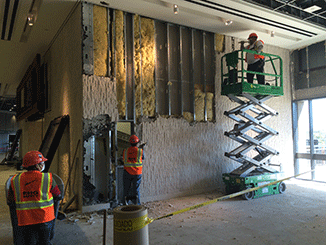 Once the walls are finished, crews will begin demolishing the existing structure for one that is smaller and sleeker. Eventually, a Starbucks Evenings – the First in Tampa – will open in that space. The Starbucks Evenings will feature wine, beer and small plates in addition to the traditional offerings. The outline for TPA’s new people-mover, now dubbed SkyConnect, is becoming clearer every day. Crews have placed much of the ground-level concrete guideway between the Taxiway J Bridge and the U.S. Post Office. Now, many of the columns and caps (pictured here) have been installed. 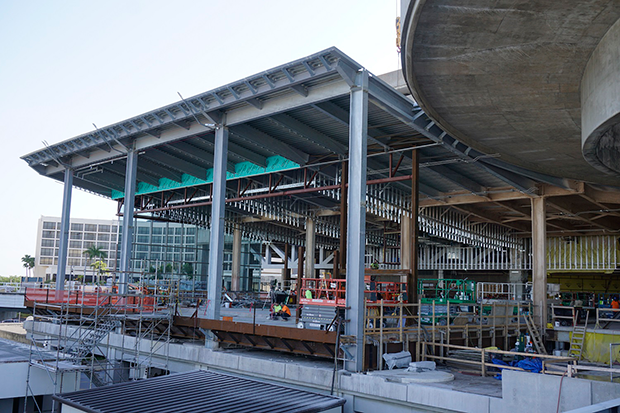 This photo depicts the guideway support structures as the guideway curves towards the Economy Garage, where it will connect to a passenger station. After months of demolition and underground work, construction crews are beginning to take the Main Terminal automated people-mover station into the air! 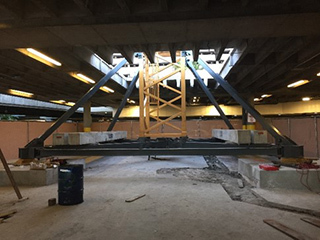 This photo shows the elevator shaft being constructed. The elevator cores and adjacent support columns will continue vertical as the new station begins to go take shape. Tampa Airport CEO Joe Lopano and dignitaries officially cut the ribbon on TPA’s first new concessions on Airside C, including RumFish Grill, Time / Shades and Starbucks. These concepts are among the first wave of 65 new shops and restaurants coming to the Airport as part of the expansion. 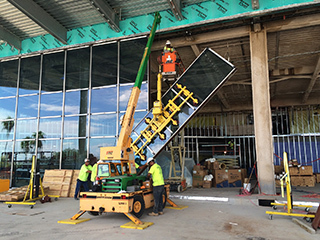 Workers with West Tampa Glass have begun installing the glass curtain wall on the Main Terminal’s northwest terrace deck. The deck, once complete, will be the future home of TPA’s new food court, which includes a Wendy’s, Chick-fil-A and Qdoba Mexican Grill. The deck is one of four new outdoor terraces coming to the Main Terminal. Overall, the Airport is adding approximately 55,000 square-feet of space to the third floor transfer level. RumFish Grill is now open on Airside C! The casual dining restaurant, well known in St. Pete Beach for its innovative and creative seafood, features a 6-foot aquarium filled with native Florida fish. The tank was designed by Acrylic Tank Manufacturers of the Animal Planet show Tanked. The restaurant was opened by TPA Hospitality Partners. Construction crews have delivered the first shipment of concrete I-Beams that will be used to support the automated people mover guideway when it’s up in the air. 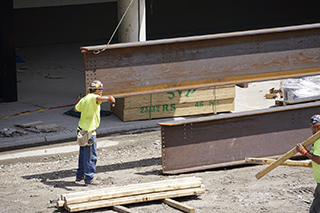 Each beam weighs nearly 50,000 pounds and, in total, there will be more than 425 beams used throughout the project. Check out our video of one beam being lifted into place! The concrete continues to flow quickly on the consolidated rental car center. 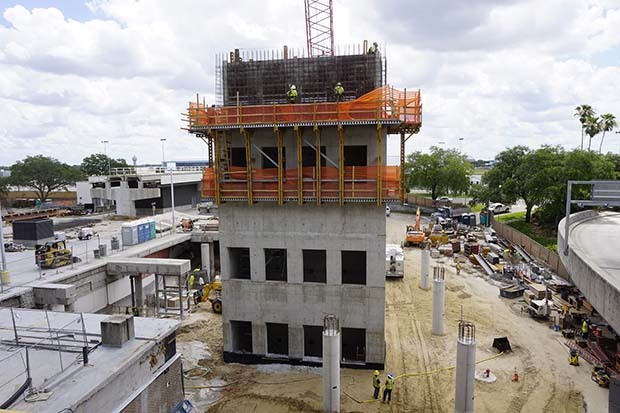 Crews have officially “topped out” on one of the eight sections that make up the rental car center, meaning they have finished the top-most level of the structure. 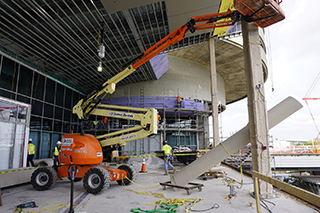 The completed section will house the customer service building, where passengers enter and exit from the Airport’s new 1.4-mile people-mover. It’s also where all of the rental car offices will be located. More than 400 workers are on site building the rental car center on any given day. Work continues to progress on the overall structure and several other sections of the rental car center are not far behind! Hear Ye, Hear Ye! A new Starbucks is now open on Airside C! The Starbucks, in the shape of a coffee bean (so cool!) is one of 65 new shops and restaurants coming to Tampa International Airport as part of the Airport’s expansion. Flying Southwest or Frontier? Go check it out! 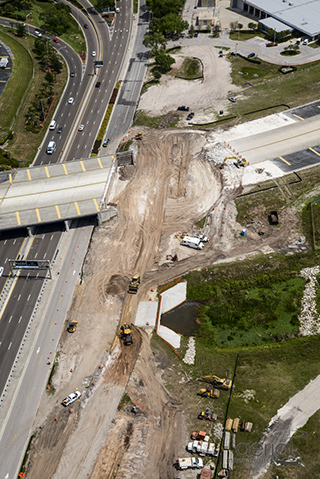 Construction workers have hit another major milestone on the Taxiway J Bridge project! 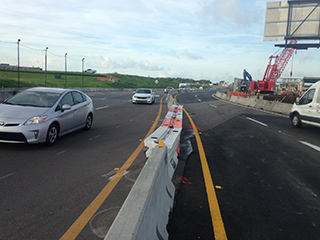 On Monday, crews rerouted the inbound lanes of the George J. Bean Parkway back to its original configuration. The new lanes now pass under the Taxiway J Bridge. This change follows the rerouting of the outbound Parkway in late February (see post below). Now, all lanes of the Parkway are back to their normal configuration around the bridge. 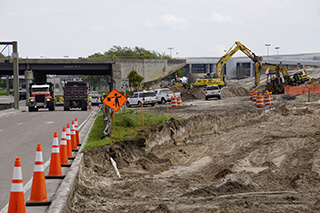 While this phase is complete, there is still a lot of construction near TPA’s roadways. The Airport asks everyone to drive safe! The first new concessions on Airside C is now open! Time Zone / Shades opened on Thursday, March 3 and is located just past security on the Airside. 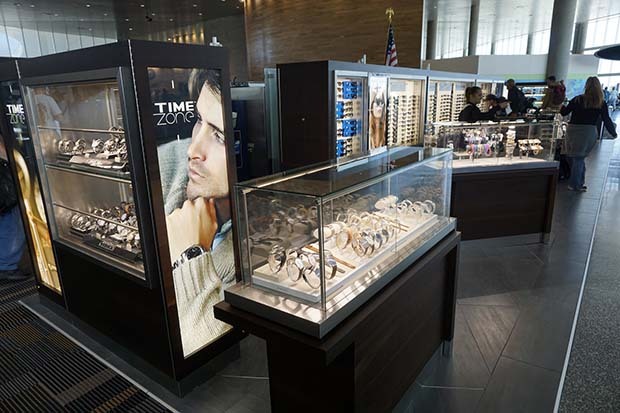 Time Zone / Shades is a specialty retail store featuring designer watches and sunglasses, including brands such as Michael Kors, Ciizen, Movado, Ray-Ban, Prada and Marc Jacobs. The new shuttle lobbies to Airside A and Airside C are one step closer to opening for passengers. On Saturday, shuttle technicians drove the Airside A shuttle inside the new berth at the Main Terminal for the first time – a major milestone for the Main Terminal expansion. The shuttles will undergo extensive testing before opening up to the public next month. TPA’s terminal expansion calls for all of the Airside shuttle lobbies (a total of 8) to be pushed back roughly 50 feet in order to open up the Main Terminal and accommodate more passengers inside of the building. It was a difficult job. Workers had a thin margin for error in building the station in order to ensure the shuttle fits into the berth like a glove. 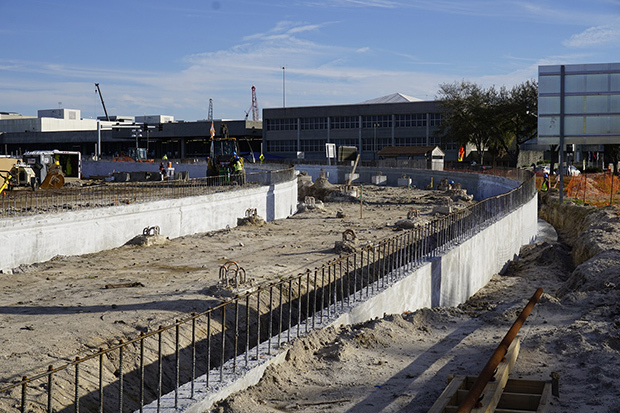 Construction is moving fast on TPA’s rental car center. In the past three months, hundreds of workers have helped take the new rental car center vertical. 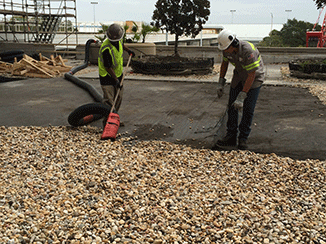 Austin Commercial estimates crews are placing roughly 2,000 cubic yards of concrete per week. That’s more than 200 concrete trucks. This picture illustrates the work on four of the eight zones that make up the rental car center. As you can see, construction has started on the top level of one of the sections. There’s still a long way to go before our roadways return to normal, but there is good news: One of the biggest construction impacts to date has ended. Late Thursday night, crews rerouted the outbound George J. Bean Parkway back to its original configuration, restoring the number of lanes back from two to three. 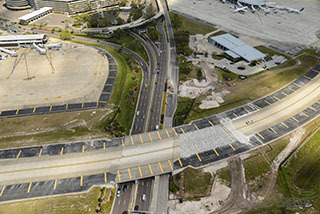 The roadway now passes under the completed portion of the new Taxiway J Bridge, which is being rebuilt and enlarged as part of TPA’s expansion. The big takeaway: All passengers leaving Short Term and Long Term parking can now head directly out of the Airport instead of looping around the Main Terminal. Passengers had temporarily been detoured around the Main Terminal to facilitate the safe construction on the Taxiway J Bridge. 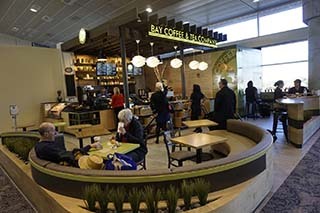 Bay Coffee & Tea Company and Auntie Anne’s are now open on Airside A! 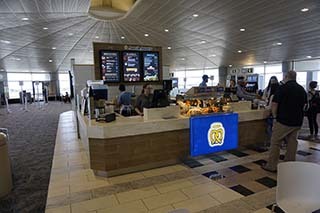 Bay Coffee, a locally-based organic coffee shop, and Auntie Anne’s, the largest hand-rolled soft pretzel franchise in the world, are the first two concessions to open up as part of TPA’s historic expansion. The Airport expects to open about 30 of the 65 new shops and restaurants this year. Construction crews have begun to pour concrete on the elevated portions of the automated people mover. The section pictured hear is near the U.S. Post Office and shows the people-mover as it begins to turn east towards the Economy Garage. As the guideway turns, it will also start to elevate. The yellow piece of construction equipment shown here is known as a screed. It is used to help smooth out and level the concrete. The concessions spaces on the east side of the Main Terminal – Hard Rock and P.F. Chang’s – are looking more and more finished every day. Contractors for the actual concessionaires will soon begin work on the spaces (Hard Rock’s space is shown in the photo on the left; P.F. Chang’s on the right), transforming them into restaurants. 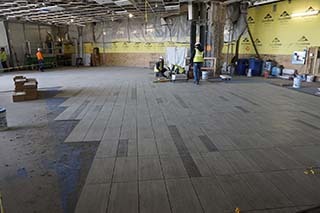 Meanwhile, workers are installing finishing touches, such as the tile and terrazzo. Feb. 11, 2016: West side steel going up. The west side of the Main Terminal is following in the footsteps of the east side. Crews on the west side are in the process of building outdoor dining terraces. 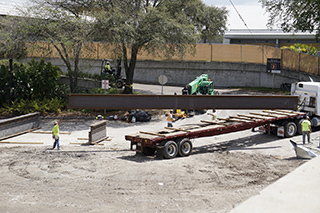 This photo shows steel going up for the northwest dining terrace, which will be home to TPA’s new food court. The food court will house Qdoba Mexican Grill, Wendy’s and Chick-fil-A. There’s a lot of working going on across the automated people mover guideway and at each of the four stations where it will make stops. 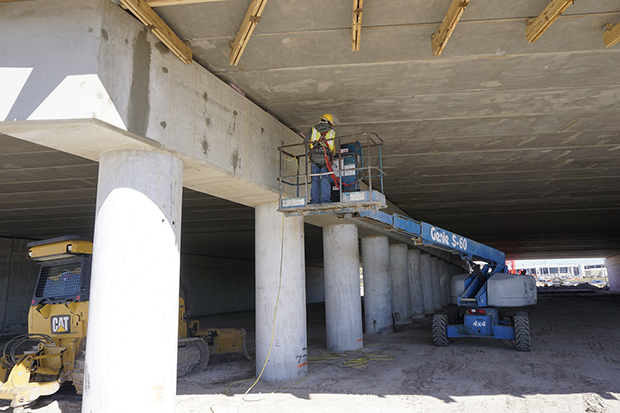 Large concrete support shafts – known as drilled shafts – are being drilled all along the project to support the people-mover guideway and stations. Concrete footers are then built on top of the shafts. On top of the footers go the columns, which support the structures in the air. The shafts, footers and columns vary in shape and size. They are all specifically engineered and designed to support the structure for an exact location. Construction crews are busy working on the automated people mover and taking it into the air. This photo depicts a curved and sloped section of the automated people mover around the U.S. Post Office. At this point, the guideway is about one-quarter of the full height it will eventually reach at the stations. Construction crews have placed all of the concrete beams for the first half of the new Taxiway J Bridge. Weighing 50,000 pounds apiece, there are a total of 108 beams. Each had to be carefully hoisted into place using a crane and a team of skilled workers. The Taxiway J Bridge is not your ordinary bridge. It’s designed to support roughly one million pounds, allowing it to accommodate some of the largest passenger planes made today, including the Boeing 747. 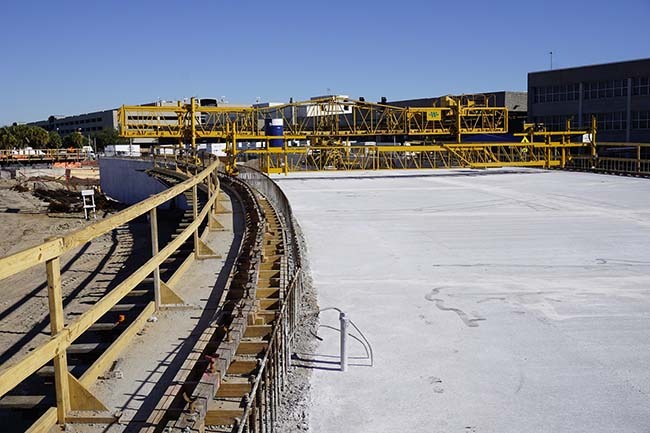 Much of the concrete for the at-grade (ground level) section of the automated people mover guideway has been poured south of the Taxiway J Bridge. Now crews are working on taking the track into the air. 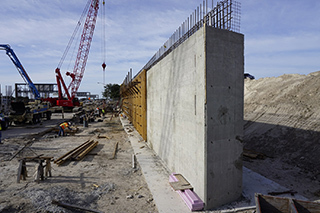 This photo shows the two concrete skirt walls on either side of the guideway as it begins to rise up into the air southward. 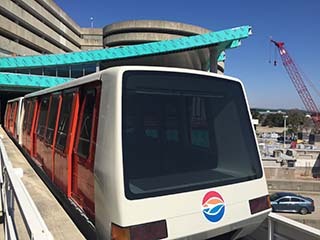 It will eventually connect to the automated people mover stations at Economy Parking and the rental car center. The track will need to go up to about 40 feet to connect to those stations. Huzzah! Construction on the Airport’s concessions receiving and distribution center has now finished, meaning the 20,000 square-foot facility will be up and running in late January. The distribution center is an important part of the Airport’s expansion and concessions redevelopment program, serving as a centralized location to safely and efficiently transport food and goods. 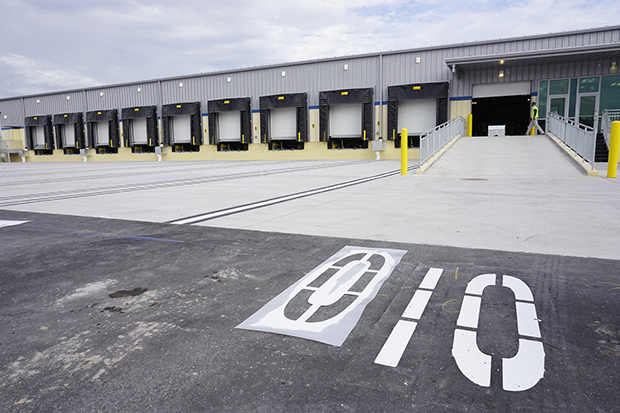 The distribution center is the first of the Airport’s expansion projects to finish. It ended on time and under budget. 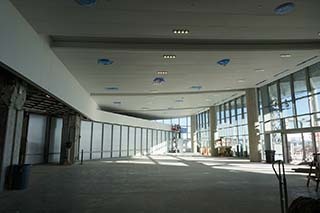 Construction crews are beginning to put some of the finishing touches on the east side of the Main Terminal. Drywall, windows and ceiling tiles have already started to appear. 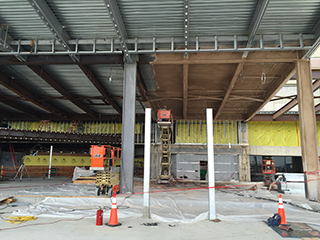 Outside on the decks, crews are covering the vertical steel beams with cylindrical concrete column wraps. The rendering on the right shows what the wraps will look like after installation. 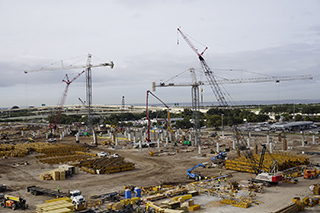 There are now eight cranes on the site of Tampa International’s 2.6-million square foot rental car center, including three tower cranes. The tallest comes in at 190 feet. It’s easily one of the busiest spots on the airport right now. 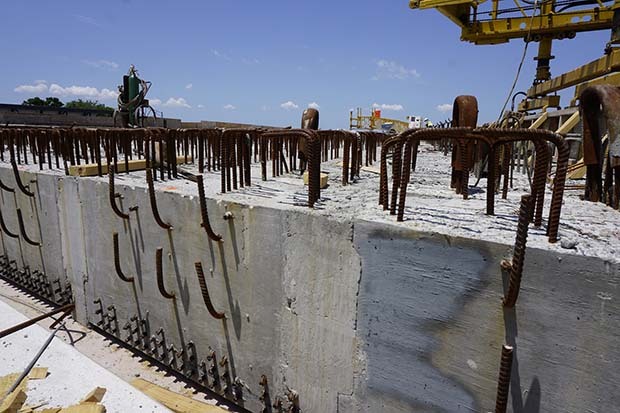 Activities include: Pouring support columns and pouring the first at-grade section of concrete (shown here in the photo on the left). Construction crews have finished pouring all the pier columns (pictured here) for one of the walls for the Taxiway J Bridge. The columns will be connected with a concrete header. Crews will then begin to form the first span of the bridge by placing large, 75-foot beams between the columns and concrete wall (under construction in the background). Once the bridge span is complete, crews will reroute the outbound Parkway underneath. 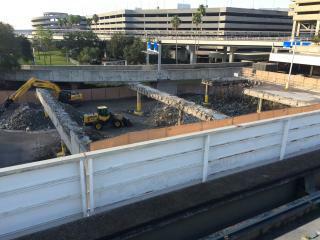 Crews have removed the final pieces of the first bank of escalators in Tampa International Airport’s main terminal. 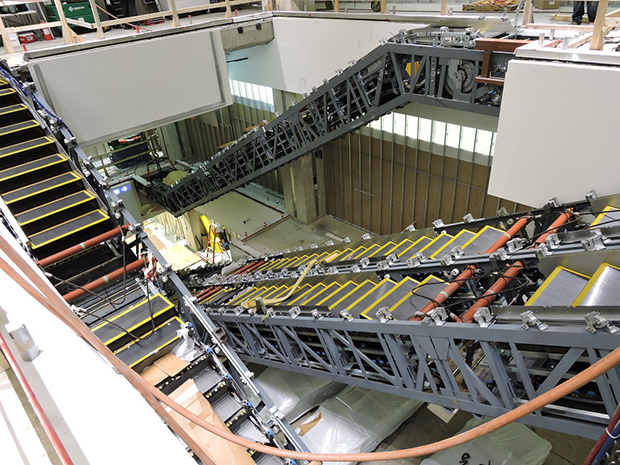 The bank of escalators – located in the southwest corner of the airport – first needed to be disassembled and then chopped up into even smaller parts in order to be wheeled out safety. 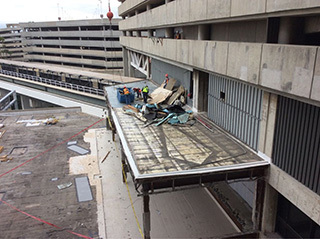 These photos show the last pieces of escalator coming down and being taken out of the terminal on dollies with the help of specialized cranes and lifts. 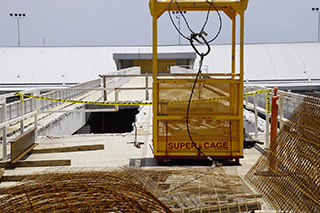 Construction crews will eventually replace all of the Main Terminal’s existing elevators. 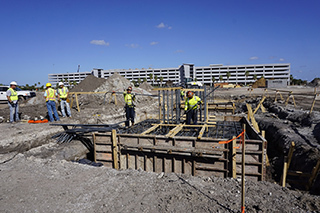 Construction is progressing on the west side of Tampa International Airport’s Main Terminal. 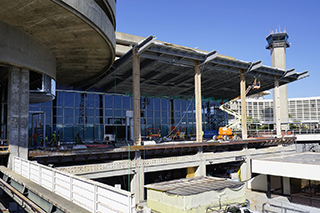 Overall, the work is similar to the east side, with crews adding two new outdoor terraces and creating more space in the Main Terminal by pushing back the existing shuttle lobbies. 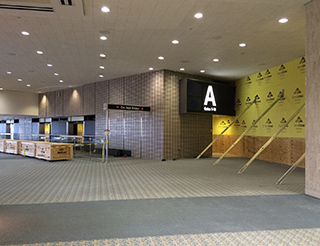 This photo shows work on the former Airside D shuttle lobby. Crews are in process of adding steel to support the new floor. Eventually, this space will become the airport’s new food court, which will feature a Chick-fil-A, Qdoba and Wendy’s. Tampa International has turned over four areas to concessionaires so they can begin work on their new spaces. 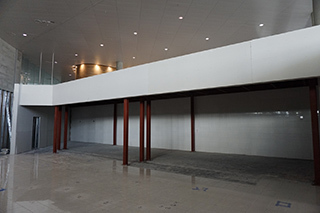 Pictured here (left) is the space that will become Bay Coffee and Tea on Airside A. 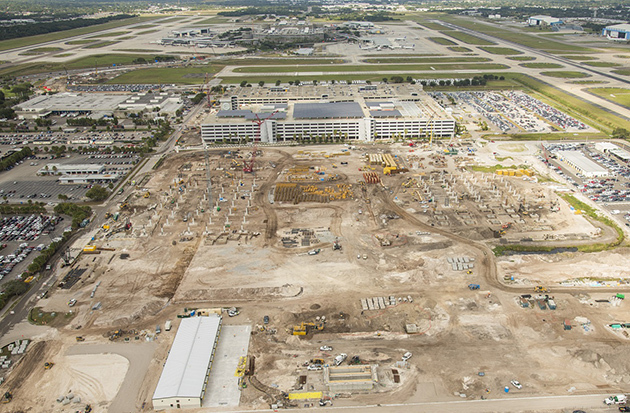 The other photo (right) shows the space that will eventually house RumFish Grill on Airside C.
There no better perspective of a construction site than from the air. Especially one as large as Tampa International’s new consolidated rental car center. The most recent aerial shot – taken Dec. 1 by Aerial Innovations – shows tremendous progress across the 56-acre site. 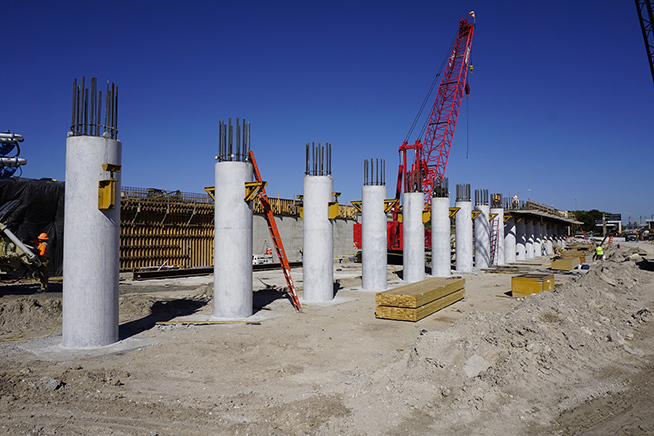 As of early December, crews had poured nearly 100 concrete support columns (pictured here). They will eventually pour a total of 452. 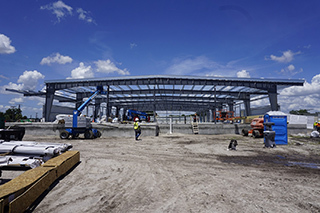 Construction is speeding along on Tampa International Airport’s new mega 2.6-million-square-foot consolidate rental car center. 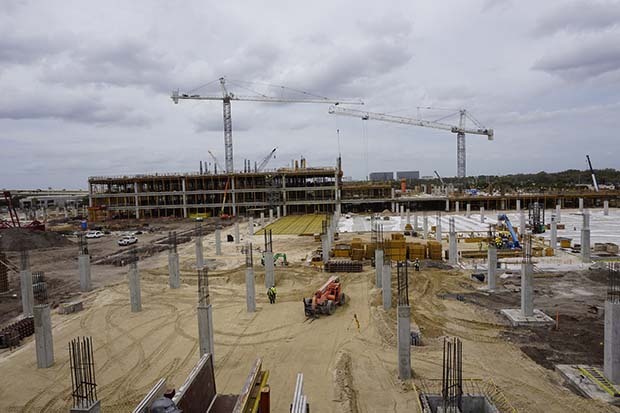 As of today, roughly 450 workers are on site, with the vast majority working on placing hundreds of concrete columns needed to support the massive structure. 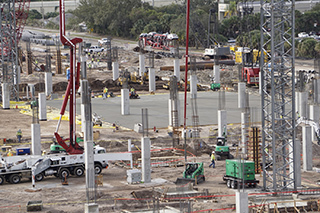 This panorama of the 56-acre site shows the flurry of activity and the first concrete support columns starting to come out of the ground. What this photo doesn’t show is all the underground work that had to take place to get here. 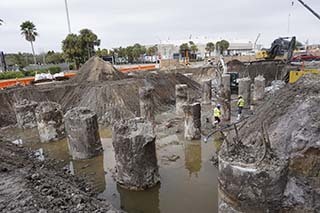 In a 6-week period, crews placed more than 3,1000 stone columns into the earth. The columns act as the foundation support for all of the concrete structure on top. 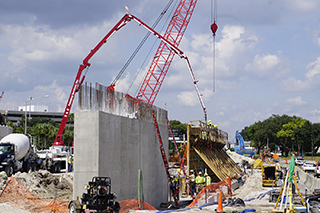 Construction on the westernmost support walls for Tampa International Airport’s new Taxiway J Bridge is underway. Crews expect to finish building the two walls by the middle of December, which will then allow them to start placing the large concrete beams for span one and two of the bridge. The new bridge will be roughly 100 feet wider and longer than the old one, and capable of handling a maximum weight of approximately 1 million pounds – large enough to accommodate the biggest planes. 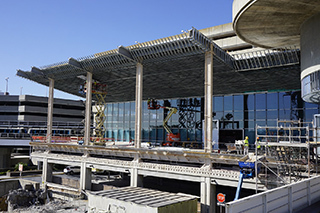 Workers with West Tampa Glass have installed nearly all the glass on the two terrace decks located on the east side of the Main Terminal. The terraces decks will be home to two new resaturants – P.F. Chang’s and Hard Rock Café. 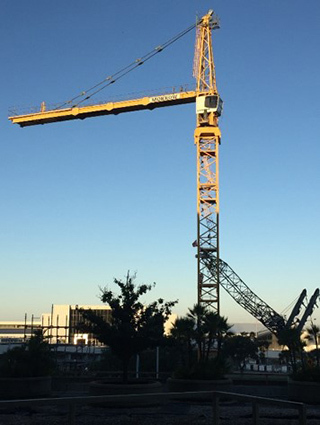 This 190-foot tower crane will be the largest used on the Airport’s master plan expansion. 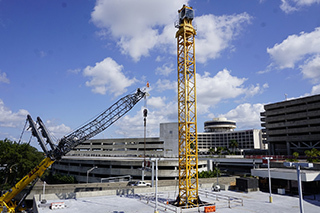 Located at the site of the consolidated rental car center, the crane will be used to build the first zone of the concrete structure. The massive crane won’t be the only – or the strongest – on the gigantic construction site. Crews will need two additional tower cranes to complete the project, including one crane that can lift 35 tons. 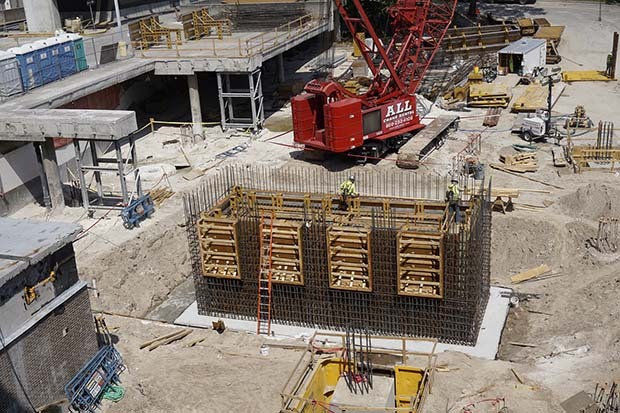 Construction crews this morning made the first of many concrete pours that will eventually make up the slab for Tampa International Airport’s new 1.4-mile automated people mover. 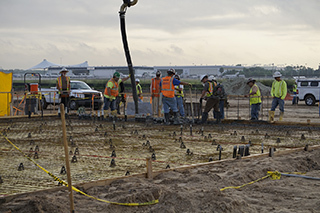 Beginning in the wee hours of the morning, it took workers some 15 concrete trucks and about eight hours to pour the 600 cubic yard section (located just south of the Taxiway J Bridge). It’s tough and messy work, but the end product is impressive: A perfectly flat and smooth concrete slab. 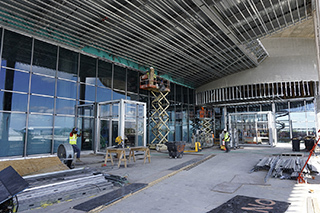 Construction workers with West Tampa Glass have placed almost all of the glass for the curtain wall on the southeast side of the Main Terminal. This wall of blue-tinted glass will separate the inside of the airport from the new outdoor terrace. The popular restaurant P.F. Chang’s will occupy the space. Construction crews are in the process of laying the foundations for the airport’s new 2.6-million-square-foot consolidated rental car center. The center, which will handle all rental car operations, will sit on sturdy concrete spread footings, which in turn are supported by numerous stone columns drilled deep underground. In this photo, construction crews are placing the rebar for one of the many footings. After the rebar is completed, concrete will be placed inside the metal form, which is used to create the shape. Once the concrete has cured, the metal forms will be removed, soil will be backfilled around the sides and work will begin at the next spread footing location. There are over 350 spread footings on the rental car center site. 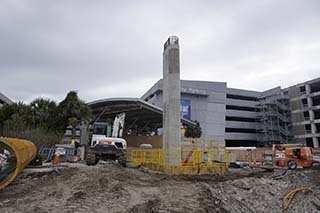 Construction crews are well underway removing the 1970s-era bank of escalators on the southwest side of Tampa International Airport’s Main Terminal. So far, they’ve stripped out all of the trends and side paneling. Next up, they’ll haul the remaining escalator structure out in large sections using a gantry crane (the large green beam spanning the opening). All the work is scheduled to be wrapped up in spring 2016. Crews will eventually replace all four of the airport’s escalator banks. Another day, another crane. Crews are now in the process of erecting a tower crane on the west side of the Main Terminal. The crane, which is 172 feet tall, will facilitate all the work on the west side, including the addition of new outdoor terraces. It will be up for about six months before it is moved to work on a different part of the west side expansion. This is the first tower crane on the airport’s Master Plan expansion. The crane is capable of lifting more than 44,000 pounds. 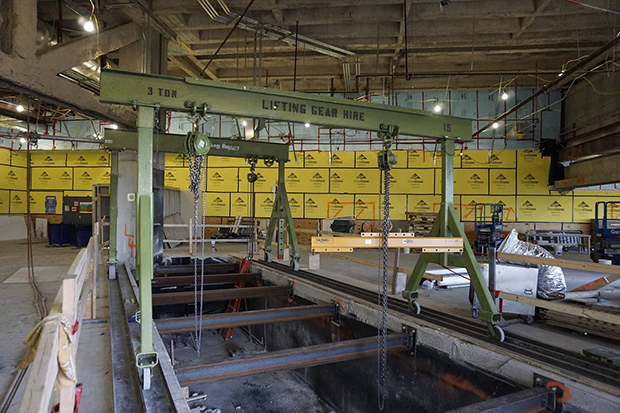 Over the next several months, this odd-looking machine will be responsible for placing roughly 3,200 stone columns for Tampa International Airport’s new 2.6-million square foot rental car center. It’s known as a vibro-replacement rig. It basically shoots and compacts small rocks into the ground to form solid stone columns on which the building will sit on. Each machine can place about 40 columns per shift. This process is the first step in building the foundations for the facility. Demolition on the Taxiway J Bridge is now complete and construction crews are in the process of building a new, wider bridge. They will work from west to east, building the bridge one span at a time. 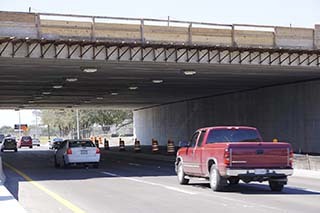 The project is expected to be complete – with traffic back in its normal configuration – by fall 2016. The aerial photos seen here were taken in February 2015 and October 2015, and show how much progress has happened in the area. Crews not only demolished the old Taxiway J Bridge, but they rerouted the inbound and outbound lanes of the George J. Bean Parkway and the Bessie Coleman Service Road. 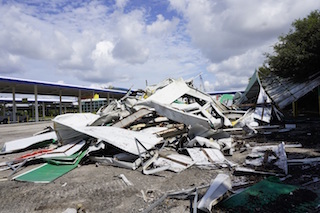 Crews have begun demolition on the old rental car service centers, starting this week with Enterprise. Once the building and all the related structures are gone, they will move on to Hertz. The buildings need to be demolished because they sit in the footprint of the airport’s 2.6-million square foot rental car center. 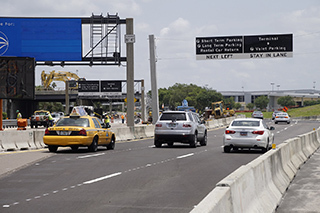 Construction on two of Tampa International Airport’s new rental car service centers is officially complete, and that means it is time for the rental car companies (Enterprise and Hertz) to vacate their old buildings. The buildings – which look simple but are actually quite complex – will be used to perform heavy maintenance, such as oil and tire changes. 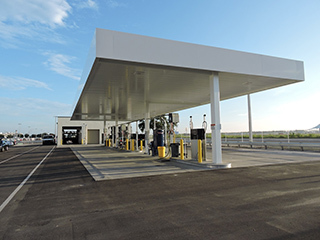 Next to each of the buildings is a fueling station and a car wash. With the opening of these new centers, crews will now begin to demolish the old ones to make room for the Airport’s new 2.6-million square foot consolidated rental car center. 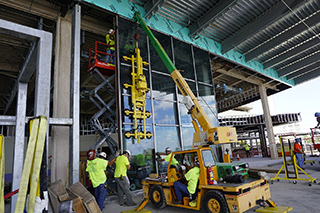 Workers with West Tampa Glass have begun installation of the glass and metal cladding on the east side of the Main Terminal – a key design element of the Master Plan expansion. The installation will take about 10 days for each of the two terraces. Each glass panel – like the one pictured here – weighs about 1,600 pounds. Crews use powerful suction cups to latch onto the glass and then lift it up using a crane. All in all, the company is installing roughly 12,000 square-feet of glass panels on the east side. 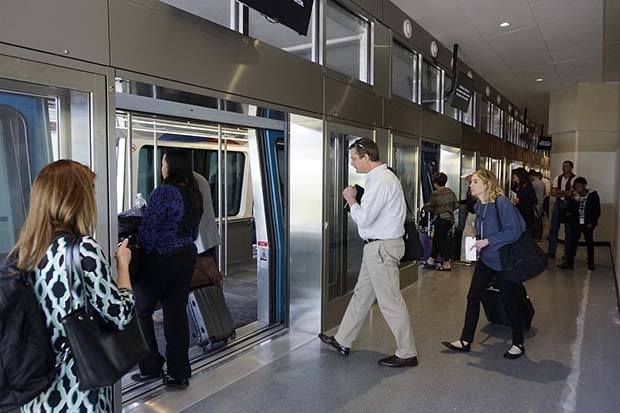 West Tampa Glass has also won a contract to do all the glass work on the west side of the Main Terminal, as well as all of the glass for the four automated people mover stations and the new consolidated rental car center. Nobody ever said steel erection was an easy job. To install steel at the top of the roof helix on the east side of the Main Terminal, a crew had to be lifted into the air using a massive crane and lowered into the helix from the top. It’s not for the faint of heart. For some perspective, the control tower in the back is 227-feet tall. The new 1.4-mile automated people mover requires hundreds of support columns. But a lot needs to happen before the columns go into the ground. One of the steps: Making a test column. That’s what is being done in this photo. 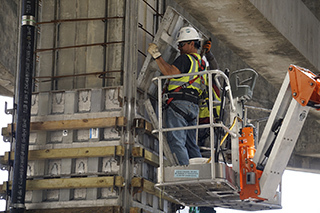 Using a crane, concrete pourer and other specialized equipment, construction crews make a concrete column underground. They then test the column to ensure their design works and meets the proper specifications before the real columns are made. With the relocation of the outbound George J. Bean parkway, construction crews began tearing down the last section of the old Taxiway J Bridge. 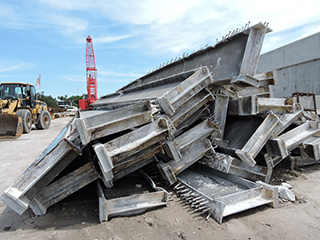 Within a few days, crews reduced the final span to piles of concrete, rebar and steel beams. Once the bridge is completely down, the new bridge will start going up with crews building it from east to west. The new bridge is being rebuilt to accommodate the airport’s new 1.4-mile automated people mover underneath. The outbound lanes of the George J. Bean Parkway shifted into a new configuration around the Taxiway J Bridge as part of ongoing bridge demolition. The road will remain as two lanes in this area and the speed limit will stay at 25 miles per hour. With the outbound lanes rerouted, it is now safe for construction crews to demolish the remainder of the bridge. The photo below shows the new roadway. It’s not visible to the typical passenger, but the southern portion of Tampa International’s property has undergone a substantial transformation in recent months. Just check out these aerial photos from April and September. In this time, workers have built two new rental car service centers, demolished the old LSG Sky Chefs building, paved a road and poured a huge swath of asphalt for new rental car parking. 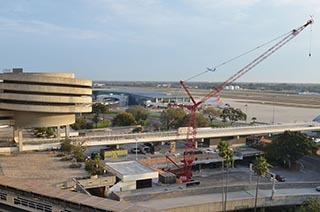 Tampa International Airport is buzzing with construction workers these days with the Airport’s largest projects months into construction. But just how many, you ask? 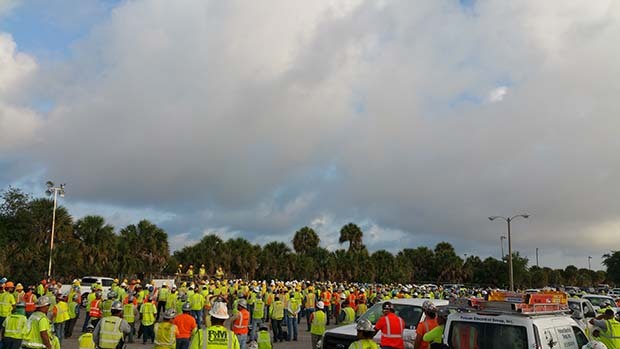 Last week alone, the Airport had more than 450 construction workers donning hard hats and safety vests to work on the $953 million expansion. That’s roughly eight times the size of the Tampa Bay Buccaneers roster. With that many workers, there’s a lot of interesting construction going on and major milestones coming in the not-so-distant future. One of the biggest: Later this fall, Skanska USA Building will complete their expansion of the Main Terminal’s east side outdoor terraces. The Concessions Receiving and Distribution Center, an important part of the airport’s revamped concessions program, is moving quickly. Crews have finished pouring the foundation and installing the building’s steel frame. They are now working to install the exterior metal walls. The building is scheduled to be operational by early 2016. 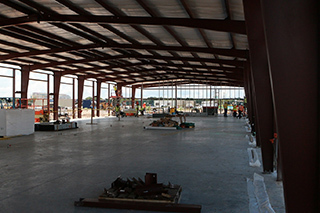 The first photo below shows the overall profile of the building, while the second shows the location for the receiving and distribution center’s massive, 2,200 square foot freezer. 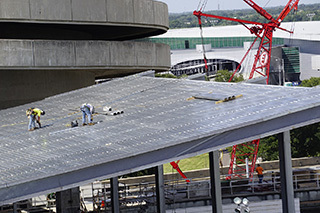 With the steel in place on the southeast terrace decks, crews have begun to protect the structure against fire with a fire-retardant foam.Fire-proofing steel? Why? When steel is heated, it can deform and weaken. In extreme conditions, steel can liquefy.The foam will help keep that that from happening. 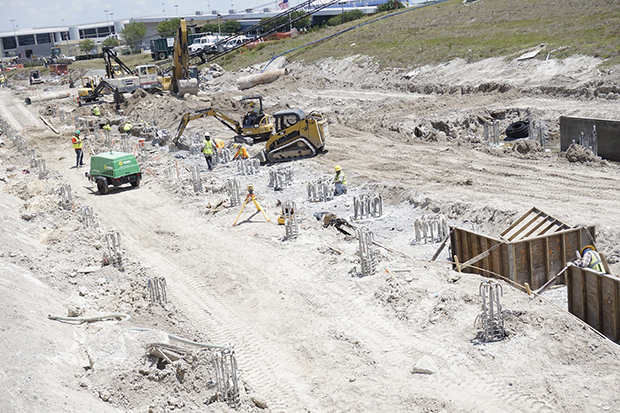 Aug. 11, 2015: Further progress on the Taxiway J Bridge. 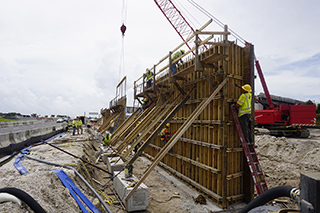 Here is another look at the progress on the Taxiway J Bridge support wall. 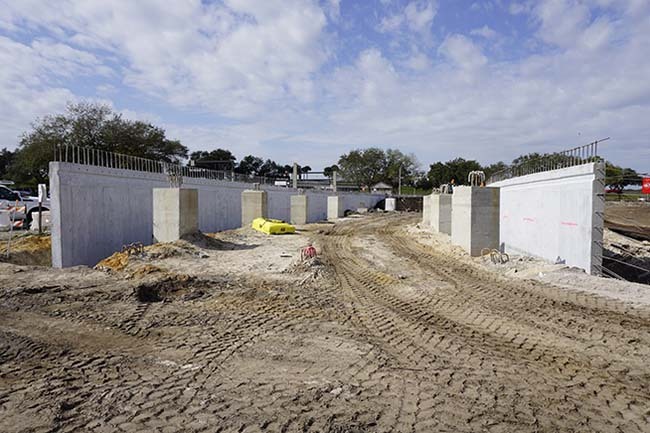 This photo shows what the concrete support wall looks like after construction crews remove the wooden forms. Behind the first section of wall, workers are pouring concrete on another section. They will repeat this process until they form one continuous wall. Two of the airport’s new rental car service center sites are nearing completion, and are expected to be occupied by rental car companies in September. The buildings will be used to perform heavy maintenance. The centers are quite complex. Each has a car wash and a fueling station in addition to vehicle lifts and the other equipment necessary to service rental cars. This photo shows the exterior of one of the service centers, which will be occupied by Hertz Rent A Car. After months of demolishing the Taxiway J Bridge, crews are now building it back up. They started by pouring concrete for one of the new bridge’s support walls. The wall will eventually separate the inbound lanes of the George J. Bean Parkway from the Airport’s new 1.4-mile automated people mover. The Taxiway J Bridge reconstruction project is an important part of the airport’s historic $953 million expansion. The airport needed to widen the 1971-era bridge to accommodate the people mover as well as potential future widening of the Parkway. The roof of one of the two new outdoor terraces is underway. With that and most of the concrete decking in place below, the southeast terrace is beginning to take on its final form. Next up: A brand new glass curtain wall. Once crews finish that work, they’ll move on to the northeast terrace. All of the east side work should be complete by late 2015. 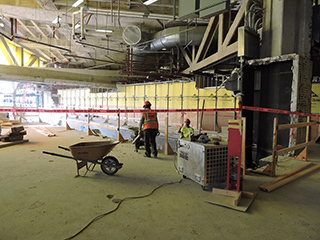 The first construction walls on the west side of the Main Terminal’s transfer level are going up, signaling the start of a busy new period inside the Main Terminal. These first construction walls will encapsulate a portion of the northwest corner of the terminal, including the lobby to the former Airside D. In the coming months, the space will be transformed into a new food court, featuring a Wendy’s, Chick-fil-A and a Qdoba Mexican Grill. Later this month, crews will shut down the bank of escalators in the southwest corner of the Main Terminal. New signs and customer service representatives will direct passengers where to go. 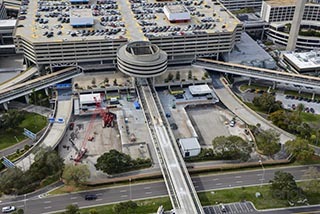 Construction crews will soon begin working on a brand new people-mover station on the east side of the Main Terminal. Before that can happen, they need to remove a large section of the guideway that stands in its place. Primarily used to run utilities to the Airside A Sort facility, demolition of the guideway is expected to wrap up in late August. The demolition is part of the ongoing buildout of the east side of the terminal. As of late July, crews were hard at work on the new outdoor terraces, placing concrete decks and erecting the steel roof. 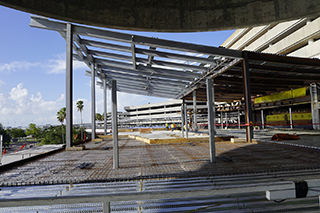 The first outdoor terraces at Tampa International Airport’s Main Terminal are taking shape. 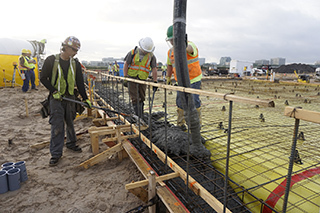 Early Monday morning, construction crews hit a significant construction milestone by pouring the first of many concrete batches needed to form the decks. The pour comes after months of hauling giant steel beams into place to create the structural framework of the terraces, and makes it possible to see exactly where people will stand or sit on the decks. 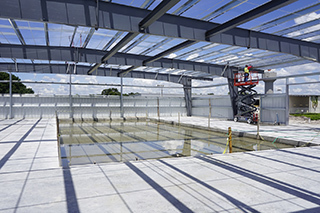 Once the concrete is poured, TPA’s glass manufacturer will be able to install new glass curtain walls. 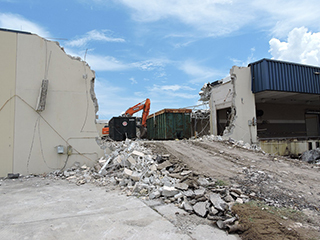 The former home of LSG Sky Chefs is coming down to make room for Tampa International Airport’s new rental car center. Demolition on the building began in early July and crews have already made significant progress, removing part of the roof and much of the interior. Crews opened up a gaping hole on the north side of the building to allow track hoes to enter and tear down the structure. 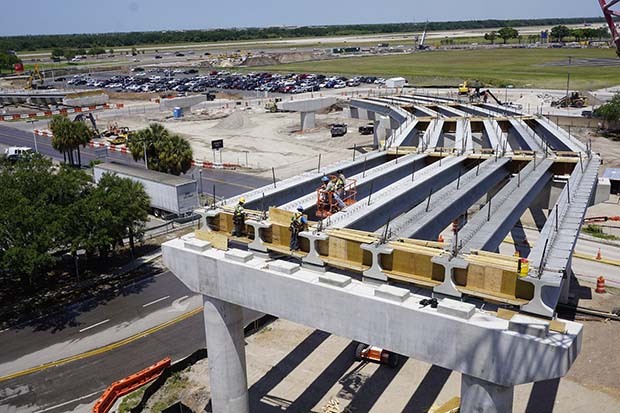 Tampa International’s new 1.4-mile automated people mover means crews will be drilling hundreds of columns in the ground to support the elevated guideway. Before that can begin, however, they first need to test the ground. 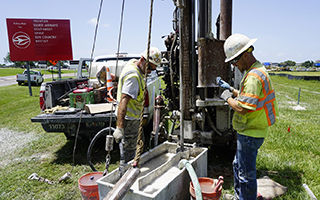 Beginning in late May, construction crews launched an extensive pilot-hole drilling program to test the ground for more than 650 planned shafts. 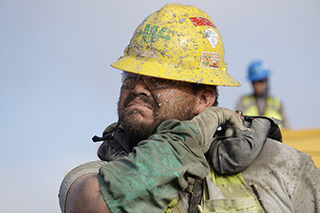 For each, workers are drilling a pilot-hole using a truck-mounted vertical-core rig (such as the one pictured here). The pilot-hole depicts the actual underground conditions where the shafts will be placed and helps determine how deep the shafts need to be drilled. Pulling off such a program is no easy feat, requiring extensive coordination with the Airport and other Master Plan construction projects. The program, led by Austin Commercial, began May 20 and is expected to end in September. 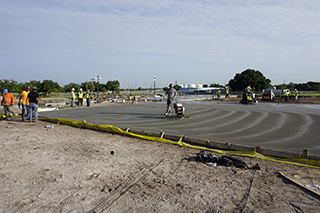 In July, crews began pouring the concrete slab for the new concessions receiving and distribution center. The center is an important part of the Airport’s expansion and concessions redevelopment program. With a much larger group of concessionaires, vendors and suppliers, the center will serve as a centralized location to safely and effectively transport food and goods, and reduce the number of trucks on airport roads. 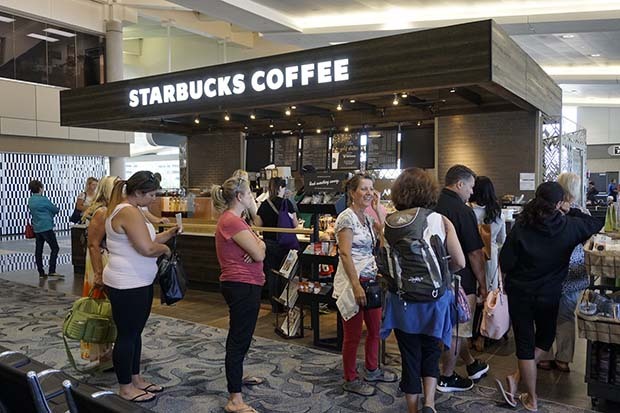 The first shop closures of Tampa International Airport’s concessions redevelopment signal the start of a great new program. Between now and late 2017, the Airport will welcome in 65 new shops, restaurants, convenience kiosks and bars. For that to happen, all of the current concessions spaces must be repurposed or refreshed. The Airport will maintain a wide selection of food, beverage and retail options on each of the Airsides and the Main Terminal throughout this process. 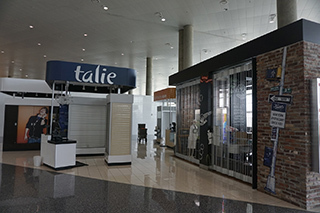 On Tuesday, concessions operators shut down four kiosks at Airside C, including Kiehl’s, Sunglass Icon, Talie and Tech in a Sec. Soon, construction walls will begin so crews can build the new space for a Guy Harvey RumFish Grill. 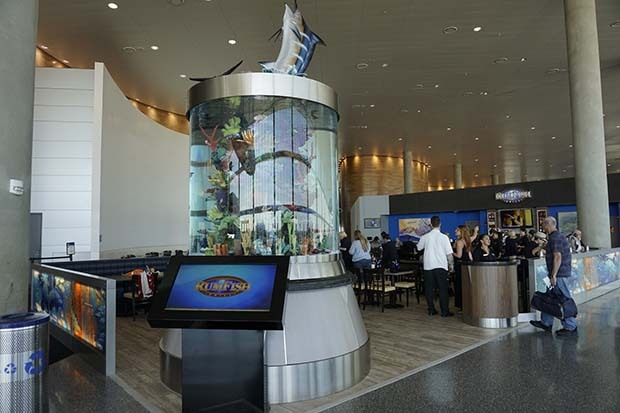 RumFish grill is a concept straight from St. Pete Beach, and features an aquarium, which will be showcase on the TV show “Tanked” during installation. The Florida Aquarium will maintain the tank and offer related educational programs. The east side of the Main Terminal is a flurry of activity as Skanska USA Building prepares to turn over a portion of its construction site to Austin Commercial in July. It’s a significant turnover and means Skanska must be finished with the guideway removal and the structural steel installation on that side of the terminal. Their cranes will also be turned over. 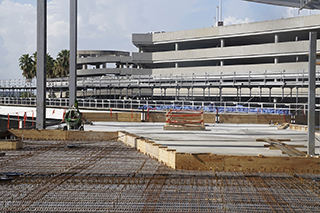 As of late June, crews were busy putting the final touches on demolition near the Airside A and C shuttle berths, placing structural steel and preparing to pour concrete to form the floor of the new outdoor terraces. Meanwhile, offsite, at West Tampa Glass, workers are preparing to deliver all the glass for the east side curtain wall. In total, the company will install approximately 175 curtain wall panels covering a total area of roughly 12,000 square-feet. 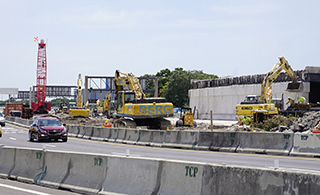 Construction crews made quick work on the middle span of the Taxiway J Bridge after rerouting the inbound lanes of the George J. Bean Parkway in early July. From start to finish, it took just over a week to tear down the middle bridge span directly over the existing inbound Parkway. Construction crews are now working on the installation of the drill shafts. Once that is done, they will begin work on a new temporary roadway for all outbound traffic on the Parkway. Once that is completed, traffic will be rerouted and the third and final Bridge span will come down. The Taxiway J project will widen the bridge to accommodate the Airport’s new automated people mover underneath, and will also make space to widen the inbound and outbound Parkway in the future. 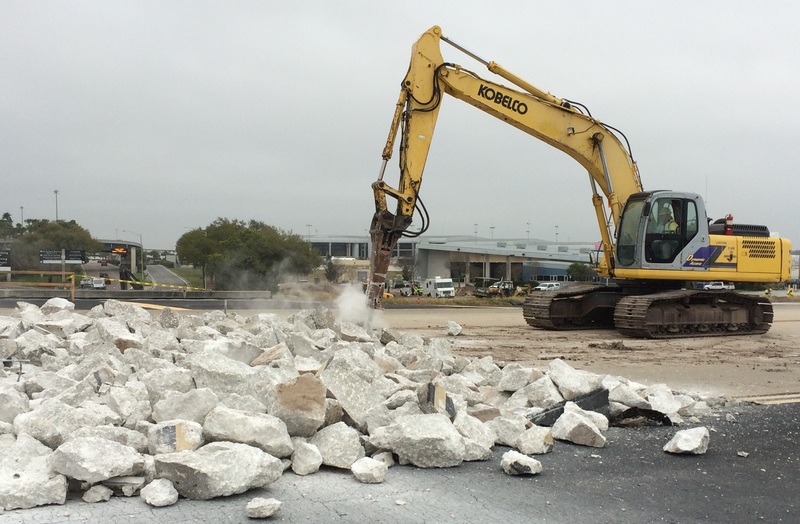 Tampa International Airport has reached a major milestone in the Taxiway J bridge reconstruction project. Late Thursday night, the inbound lanes of the George J. Bean Parkway were rerouted and one lane of the outbound Parkway was closed to allow demolition to continue on the bridge. This configuration will remain in place until early 2016 and are a necessary part of the Taxiway J reconstruction project. Rerouting the inbound lanes of the Parkway around the bridge allows crews to demolish the span of bridge directly over the exiting inbound parkway without any traffic underneath. The closure of the outbound lane is also necessary to safely demolish the bridge. The Taxiway J project will widen the bridge to accommodate the Airport’s new automated people mover underneath, and will also make space to widen the inbound and outbound Parkway in the future. Construction and renovation on three of the Airport’s four rental car service centers is now well underway. Service centers 1 and 2 – 15,000-square-feet and 17,500-square-feet, respectively – are the farthest along and are scheduled to be turned over to the rental car companies this fall. 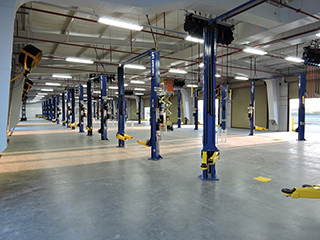 The new centers are where all the on-site rental car companies will perform heavy maintenance, such as oil changes. The photo shows service center 2. So far, crews have erected the steel frame and have laid the roof. 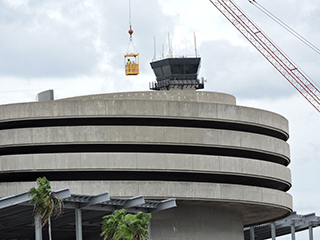 The roof of Tampa International Airport’s new east side terraces is one of the most striking architectural features of the Airport’s historic expansion, sloping gently toward the sky before merging into the new automated people mover station. This week, crews delivered and began installing the curved beams necessary to make that happen. Arriving by semitrailer truck and then lifted in place by crane, each of the beams is roughly 50 feet long and weighs about 5,000 pounds. The east side terraces will be open by late 2017, featuring outdoor dining for the first time at the Main Terminal. The first of the Airport's new rental car service centers is beginning to take shape. Roughly 17,500 square feet with 20 vehicle bays, the center will be operated by the Airport's rental car companies and will support all the rental car activities at the nearby 2.6-million square foot consolidated rental car center. It's taken crews about two weeks to get to this point, and the facility is expect to be fully constructed by late summer. The service centers are where all the rental car companies perform heavy maintenance, such as oil and tire changes. Crews are building three new rental car service centers and remodeling a fourth. 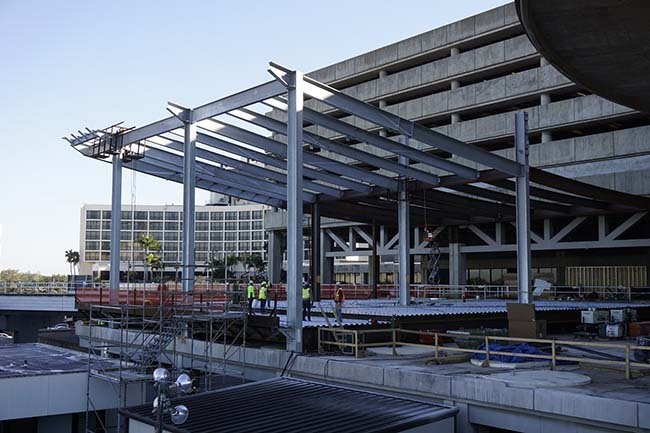 Construction workers have laid most of the structural steel on the east side of the main Terminal, and the outdoor dining terraces are beginning to take shape. 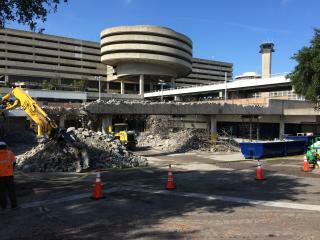 Meanwhile, inside the terminal, the demolition of the existing space continues. Over the last several months, crews have been carefully dismantling virtually everything in this area, including walls, ceilings, stairs and part of the Airside A shuttle bay. These two photos show the big changes to the Airside A guideway since the beginning of the year. Take a trip down around the future site of the rental car center and you’ll find a number of large machines spinning and twirling on the top of large concrete slabs. We call them concrete Zambonis. Operated by a worker sitting on top of two large spinning blades, the machines act like giant buffers, smoothing out concrete until it is polished to a nice, smooth finish. They are officially known as trowels, but they go by a lot of different names, including power floats, helicopters, trowel machines and … whirlybirds. Here is a short video of the machines in action, helping smooth the concrete pads at our rental car service sites. Looks like fun. 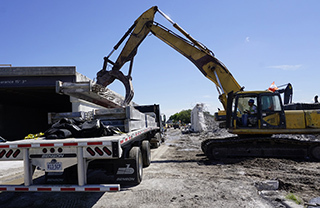 After rerouting the Bessie Coleman service road in late April, crews began tearing down the east span of the Taxiway J bridge, pummeling concrete, ripping out rebar and removing steel beams. Averaging 7,500 pounds each, it only took a few days to pull out the steel beams. 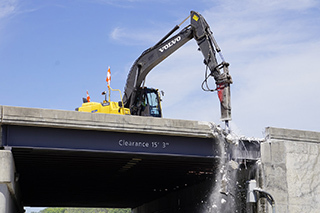 This photo depicts an excavator with a specialized attachment hauling away a beam next to the remnants of the east side of the bridge. 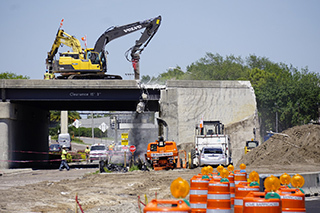 The bridge reconstruction project is a key part of the Master Plan expansion and is necessary to accommodate the airport’s new people mover, which connects the Main Terminal to the Economy Parking Garage and new rental car center. Demolition on the Taxiway J Bridge is underway. After months of excavation and demolition next to the bridge, a pair of large hydraulic breakers – picture giant jackhammers – has begun to tear down the easternmost span of the bridge, breaking apart its thick concrete. 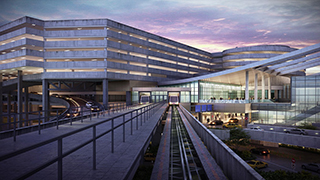 The bridge project is a key part of the Master Plan expansion and is needed to accommodate the airport’s new people mover, which connects the Main Terminal to the Economy Parking Garage and new rental car center. “There’s nothing like pouring concrete in the morning,” a construction worker shouted over the sound of whirling concrete trucks. After weeks of earth moving and preparation, construction works began to place the first concrete slab that will form the foundation for one of the Airport’s new rental car service centers. It’s one of four service centers that will be operated by the airport’s rental car companies and will support all the rental car activities at the nearby 2.6-million square foot consolidated rental car center. The service centers are where all the rental car companies perform all of their heavy maintenance, such as oil and tire changes. 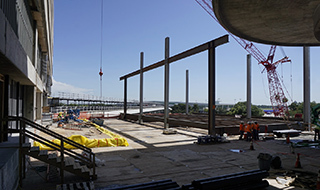 Crews have begun to install the first of numerous massive structural steel beams on the east side of the Main Terminal. These beams form the skeleton of the outdoor terrace structure. The tall vertical beams pictured here will support the new roof of the outdoor terrace, which curves upward toward the sky. The horizontal beams attached to the deck will form the future floor of the outdoor terraces. All together, the east side expansion will require some 279 tons of structural steel. 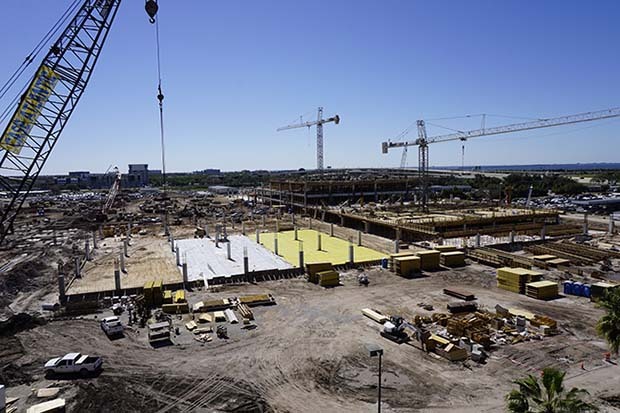 The first shipment of large steel beams – the bones of the east side Main Terminal expansion – arrived at Tampa International Airport this week. After months of demolition work, crews will begin to install the structural steel beams later this month. The beams range largely in size with the largest coming in at approximately 15,480 pounds. All together, the east side expansion alone will require some 279 tons of structural steel. Much has happened since the Hillsborough County Aviation Authority officially broke ground on its historic Master Plan expansion project in November 2014. 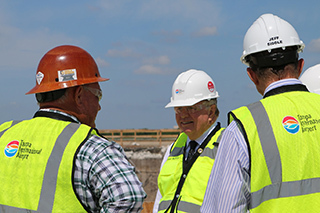 In early April, HCAA Chairman Robert Watkins toured the construction sites. After a brief safety presentation, he, Airport CEO Joe Lopano and team swung by the east side of the Main Terminal for a look at the ongoing demolition of the interior, shuttle bays and outside decks. 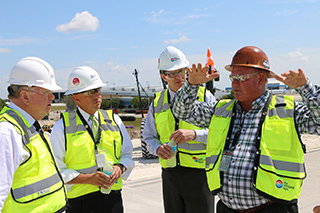 From there, the group stopped in at the Airport’s construction trailer complex for a presentation on the 2.6-million square foot rental car center and automated people mover. Last up was a stop at the Taxiway J Bridge, pictured here, where he checked out the large amount of earth crews have excavated in recent weeks. Excavation on the Taxiway J Bridge project, which greets all visitors as they drive to Tampa International Airport, is nearing completion. Next up: Construction of a new temporary road and demolition on the actual bridge itself. But before we get there, check out these aerial photographs showing the bridge’s dramatic transformation in just a month. All in all, crews hauled away roughly 25,000 cubic yards of dirt, representing more than 2,000 truckloads. What do they do with all the dirt? Well, for now, at least, they’re piling it in a gigantic pile in an empty lot near the airport’s old cargo building. Check it out. Crews are making significant progress in the Taxiway J Bridge reconstruction project. For weeks now, workers have excavated tons and tons of dirt along the east bank of the bridge (shown here) in preparation for its demolition, which is needed to accommodate the airport’s new automated people mover connecting the Main Terminal to the Economy Parking Garage and new rental car center. Next month, the Bessie Coleman service road will be rerouted through this newly excavated ravine so crews can safely demolish the first span of the bridge without endangering drivers. What you’re looking at here is the approximate location of the future temporary service road. 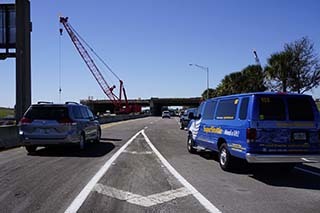 More than three dozen construction trailers have been winding their way to the southernmost part of Tampa International Airport over the past several weeks, forming the central command center for what is the Airport’s biggest Master Plan construction project. They call it Trailer City. And as of this week, it’s open for business. Made up of 39 trailers divided into four clusters, the occupancy of these temporary offices represents an important and significant milestone for the airport’s expansion project. 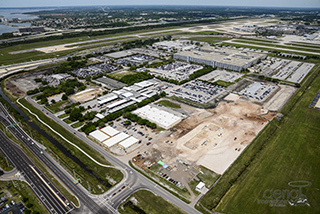 From this location, the Hillsborough County Aviation Authority as well as Austin Commercial will direct operations and construction of the rental car center, the new rental car service centers and all of the structures associated with the new automated people mover. That represents the lion’s share of Tampa International’s historic $943 million expansion. It’s no easy feat. 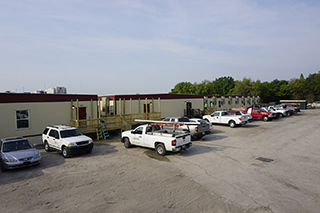 While they may look like simple trailers, they are every bit as sophisticated as a regular brick-and-mortar office, complete with cubicles, break rooms, bathrooms and even small and large conference rooms. They’ve got power, data, utilities, printers –everything needed for a successful office. 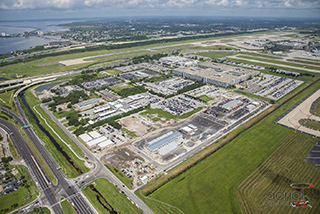 Runway operations at Tampa International Airport changed slightly this week with the temporary closure of Runway 10-28 for construction related to the airport’s Master Plan expansion. The east-west runway, which is primarily used by smaller general aviation aircraft, officially closed on Monday and will remain shutdown until early May as construction is underway. The runway will be shortened by roughly 500 feet to make room for the airport’s new automated people mover that will connect the new rental car center and economy parking garage to the main terminal. The closure is not expected to have a significant impact on airport operations due to the relatively low use of the runway. 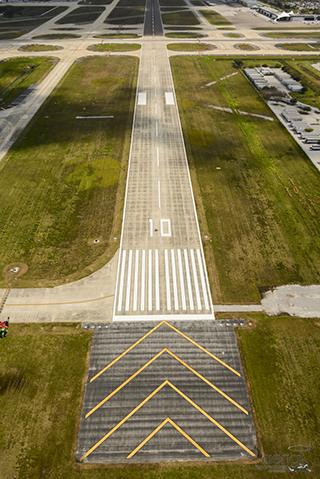 Once construction is complete, the runway will reopen with normal operations. It’s hard to miss the dramatic changes happening at the Main Terminal. What’s happening to the south, however, is just as impressive. 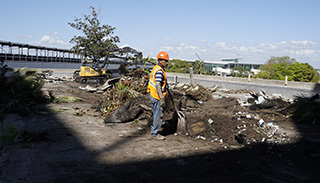 Around the future site of Tampa International’s rental car center is a flurry of activity with excavators removing tons of old earth, dump trucks bringing loads of new soil, compactors rolling and smashing. 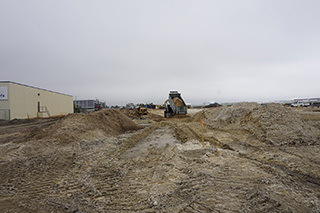 Crews are leveling dozens of acres of land to prepare it for multiple new buildings, including three service center sites for the airport’s rental car companies. They’ve made a lot of progress. Let’s take a break from the Main Terminal renovation for a second and focus on what is going inside of it. On March 6, airport officials held one of three focus groups to test a number of different furniture options for the Main Terminal. It’s no simple decision. 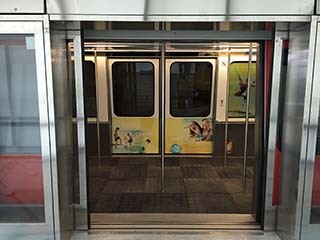 Testers had to weigh a range of factors, including aesthetics and comfort, durability, ease of use and how the furniture meshed with the airport’s overall look and feel. 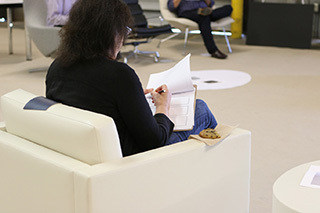 Here you see one of the test group members giving her feedback while sitting on one of the chairs and enjoying a cookie. For weeks, crews have worked to transform the east side of the Main Terminal, ripping out ceiling and insulation, smashing concrete, tearing out walls and taking apart shuttle berths. Slowly, it’s starting to look like a different place. 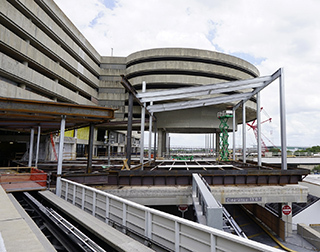 This transformation will become even more apparent later spring when the airport begins to install the first of many new steel beams – the framework for the new outdoor terrace. 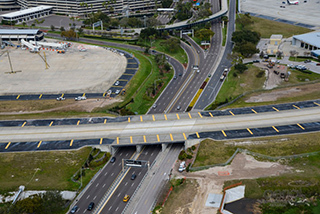 The Taxiway J Bridge, which spans the George J. Bean Parkway, officially closed on Feb. 11 and construction crews worked quickly to fence it off to planes and vehicles. With the area now closed off, crews began demolition work on the taxiway to the east of the bridge, using huge saws to cut through the 17-inch concrete and hydraulic hammers to break it up. All the concrete and asphalt will need to be removed, along with thousands of cubic meters of dirt, before work on the bridge itself can start. 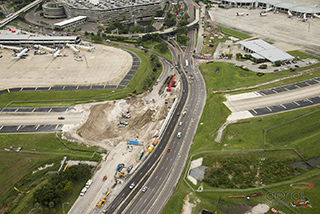 Once everything is out of the way, the airport’s main road and service road will be rerouted along temporary roads, so the bridge can be demolished and rebuilt with space for the new automated people mover underneath. While the first big crane was assembled outside, construction crews were busy demolishing the Main Terminal’s east side interior. The carpets went first, then the ceiling and walls. Just outside on nearby decks, crews used a giant rock-gobbling vacuum to remove tons of ballast needed to secure the roof in place. Operating like any household vacuum, the rocks were sucked up through a long black hose, down a floor to the ground level and into a giant metal container. This work clears the way for crews to build the airport’s two new outdoor terraces. 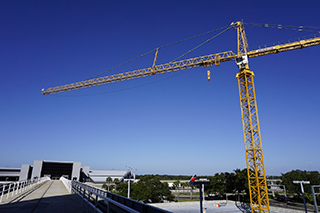 The first of several big cranes that will work on Tampa International Airport’s historic Master Plan expansion arrived in late January. Located on the east side of the Main Terminal, the massive Manitowoc 14000 crane has a 282-foot boom and a 220-ton capacity. It will play a key role in demolishing and rebuilding that side of the terminal, which will feature new outdoor terraces. Assembly on the crane began Feb. 2 and it took crews – with the help of another smaller crane – about two days to piece together. Check out our cool time-lapse video to watch the assembly unfold! A tremendous amount of work needs to happen before construction of the airport’s multi-million square-foot rental car center can actually begin. That includes providing a space for the team in charge of building the facility. 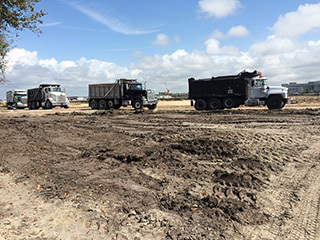 In January, large earth-movers cleared and leveled land near the south of the airport’s property to prepare it for a large number of trailers needed to house the contractors and sub-contractors working on the project. 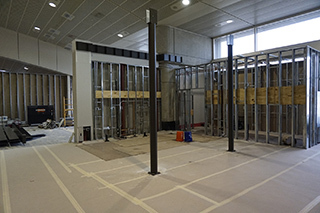 The first construction walls inside the Main Terminal went up in January, signaling the start of a significant new period for the airport’s Master Plan expansion. Stretching from Airside A to Airside C, the walls enclose a large portion of the terminal’s east side, including the smoking deck and one of the two shuttles to each of the airsides. A dramatic transformation is taking place behind the scenes. When it’s finished, the area will be larger, more spacious and will feature new outdoor dining terraces and lounge areas. 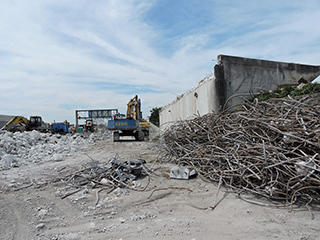 Heavy demolition began at Tampa International Airport in December on the east side of the Main Terminal. Pictured here are the remnants of one of the airport’s quad decks. 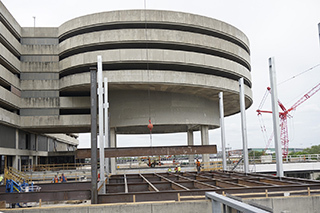 It’s one of two large concrete decks that needs to be removed on the east side in order to make way for the airport’s new automated people mover station that connects the Main Terminal to economy parking and the new rental car center. The decks were taken down in a matter of weeks using one of our favorite pieces of concrete equipment: The concrete processer. With heavy metal teeth, the machine bites down with enough force to pulverize concrete into dust and snap rebar in two. It also has another benefit: It’s far quieter than other demolition options and won’t disrupt our passing passengers and guests. 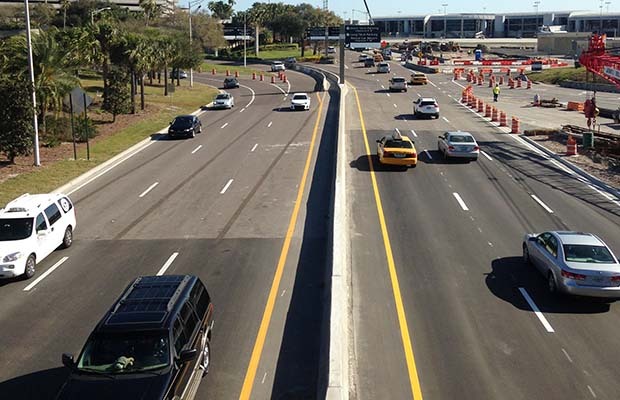 The first visible changes tied to Tampa International Airport’s Master Plan expansion began in late 2014 alongside the George J. Bean Parkway, the main roadway passengers use to get into the airport. Starting in October, crews began relocating a number of utility lines running parallel to the road. Moving these utilities was essential to make way for the new 1.4-mile automated people mover that will eventually be built next to the Parkway. In these photos, you can see some of this early work. 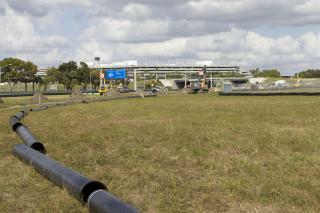 Taken in early November 2014, these images show some of the airport’s contractors as they lay new water and sewage pipes.